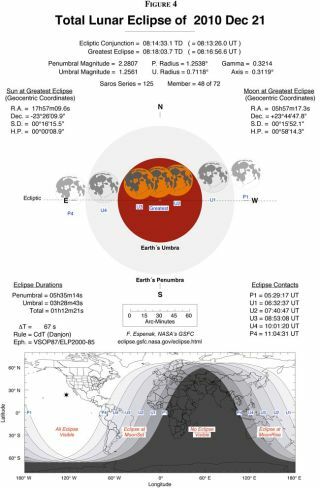 This NASA chart depicts which countries will be able to see the total lunar eclipse of 2010 on Dec. 20-21. Partsof four continents will be treated to a view of atotal eclipse of the moon during the overnight hours of Dec. 20 to Dec.21. Thisspectacle of celestial shadows will be the best of its kind residentsof NorthAmerica will see until the year 2014. December'stotallunar eclipse is the only total eclipse of the moon of thisyear. For theWestern Hemisphere, the eclipse will "officially? begin on Dec. 21 at12:29 a.m. EST (9:29 p.m. PST on Dec. 20) as the moon begins to enterEarth'souter, or penumbral, shadow. Buteven in clear weather, skywatchers will not noticeany changes in the moon's appearance until about 45 minutes later whena slight"smudge" or shading begins to become evident on the upper leftportion of the moon's disk. ThisNASA lunar eclipse chart shows the visibilityof the eclipse from different regions around the world. Whileit can be seen in its entirety from North andCentral America, parts of the eclipse can also be seen from Europe,northwestern Africa and parts of Australia. It will not be visible fromsouthern and eastern Africa and India. Lunareclipses occur when the moon passes through a pointin its orbit in which the Earth is directly between it and the sun.When the moonenters the shadow of Earth, it creates a lunar eclipse. Atotal lunar eclipse is when the entire moon iscompletely inside the Earth's shadow. Since the sun's rays are bent byEarth'satmosphere so that some still reach the moon, the moon is still visiblein aneclipse. ForDecember's lunar eclipse, the first definitive changein the moon's appearance will come on the moon's upper left edge. At1:33 a.m. EST(10:33 p.m. PST), the partial phase of the eclipse will begin as theEarth'sdark shadow ? called the umbra ? starts to slowly creep over the faceof thefull moon. At2:41 a.m. EST (11:41 p.m. PST) the eclipse will reachtotality, but sunlight bent by our atmosphere around the curvature ofthe Earthshould produce a coppery glow on the moon. Atthis time, the moon, if viewed with binocularsor a small telescope, will present the illusion of seeminglyglowing fromwithin by its own light. At3:18 a.m. EST (12:18 a.m. PST), the sun, Earth and moonwill be almost exactly in line and the light of the moon ? assumingclear skies? will appear at its dimmest. Totalityends at 3:53 a.m. EST (12:53 a.m. PST) and the moonwill completely emerge from the umbra at 5:01 a.m. EST (2:01 a.m. PST).About15 or 20 minutes later, the last vestige of the fainter penumbralshadow willdisappear from the moon's upper right edge and it will return to itsnormalbrilliance. Theentire 72 minutes of the total lunar eclipse will bevisible from all of North and South America, the northern and westernpart ofEurope, and a small part of northeast Asia including Korea and much ofJapan. Totalitywill also be visible in its entirety from the North Island of NewZealand andHawaii. Inall, an estimated 1.5 billion people will have anopportunity to enjoy the best part of this lunar show. Inother parts of the world, either only the partialstages of the eclipse will be visible or the eclipse will occur whenit'sdaytime and the moon is not above their local horizon. Portionsof western Africa and central Europe can catchthe opening stages of the eclipse before the moon sets below theirhorizonduring the morning hours of Dec. 21, while the eastern third of Asiaandcentral and eastern Australia can catch the closing stages just aftermoonriseon the evening of Dec. 21. Generallyspeaking, about half of the world's population? about 3 billion people ? will be able to view at least a part of thiseclipse. Forany one location, total lunar eclipses occur at anaverage frequency of four or five times per decade. The lasttotal eclipse ofthe moon occurred on Feb. 20, 2008. Therewill be two total lunar eclipses in 2011. The firstwill occur on June 15 and will be visible from most of the EasternHemisphere. Thenon Dec. 10, those living in the western half of North America will beable tocatch totality just before moonset. Notuntil April 14, 2014 will a total lunar eclipse againbe visible in its entirety from North America. Althoughastronomers do not expect to gain newastronomical insights from the eclipse, lunar eclipses vividly reflectthe overallstateof the Earth's atmosphere. Undernormal weather and atmospheric conditions, as the moonslides into the shadow of the Earth, its normal yellow-white colorchanges intoa still-visible but dull coppery-red at the height of the eclipse. However,because of the recent eruptions of the MountEyjafjallaj?kull volcano in Iceland last spring and the Mount Merapivolcano inIndonesia in October, one and possibly two clouds of ash and dust mightbecurrently floating high above the Earth. As a result, the moon mayappeardarker than usual during this eclipse; during totality, parts of themoon mighteven become black and invisible. There'salso another possibility for the upcoming lunareclipse. Themoon might wear its normal eclipse cloak of a deepred or a coppery-hue or take on still other colors (orange, chocolatebrown orgray). Color possibilities are unpredictable and that it isimpossible to tellexactly how much light the earth's atmosphere will refract as itsshadow creepsacross the moon. Cloudcover and other atmospheric conditions may alsoaffect the visibility and coloration of the moon. Inshort: we'll all just have to wait for eclipse nightand see what actually happens. SPACE.comwill provide a more detailed outlook on theeclipse during a Dec. 17 skywatching alert, with an Eclipse Observer'sGuide comingon Dec. 20. So you'll be covered for all your total lunar eclipse needsthisholiday season.